On June 17th, while my wife and I were vacationing in lovely Sicily, The Music and Myth quietly turned three years old. I say “quietly” because I usually have an article up, wishing my oldest writing venture a happy birthday. Since that wasn’t possible this year, I chose to commemorate the special date with a belated birthday article. Florence + the Machine’s Lungs was the first record I ever reviewed for The Music and Myth. I thought this would be a proper occasion to write something about the band’s third installment, How Big How Blue How Beautiful. The newly released studio album follows the elegant Ceremonials and attempts to do the right thing from a creative standpoint by pursuing a completely new musical direction. But is it the right one? Until very recently I would have said no. With Ceremonials and the subsequent single “Breath of Life” the band has completely exhausted the creative territory of “big choirs and massive orchestration”. Any attempt to continue in the same vein or try to surpass “Breath of Life” – in my opinion the band’s most powerful song to date, with its heavy theme, booming percussion and sixty-piece choir – would most likely have been destined for failure. But it was exactly this song’s magnificent execution that made the follow up, “What Kind of Man”, feel like a disappointment. Hearing Florence Welch sing about “complicated” relationships just felt like a step backwards, in spite of the song’s catchy, straight-up rock vibe. It just didn’t feel like something Florence and the band should be doing in 2015 but more like a track that belonged either before Lungs or somewhere in between the debut and sophomore releases. The fact that it was chosen as the first promotional single did not predict good things and I had low expectations for the record to begin with. Fortunately, there was ample room to be pleasantly surprised. I still feel that both this track and “Ship to Wreck” were poor choices for promotional singles because the record has so much more to offer than these two songs would suggest. They are also used as opening tracks with the former following the latter. Initially, it felt like a bad omen for this new project to open with the words, “Don’t touch the sleeping pills, they mess with my head” and continue through a typical Welchian dreamscape of “great white sharks swimming in the bed” and “red-eyed mice scratching at the door” only to reach the hackneyed indecision: “Did I drink too much, am I losing touch, did I build this ship to wreck”. Catchy as the lyrics and riffs may be, it still felt like a considerable narrowing of the pensive scope, especially since Ceremonials opened with “Only if for a Night and “Shake it Out” and followed those up with “What the Water Gave Me”. On the latest record, the so-so openers are followed by the title track, the first to hint that there might be more to this album than meets the ear. Indeed, the record seems to be the lead singer’s most personal endeavor to date, an almost confrontational recount of exhaustion, heartbreak and emotional turbulence. That makes it perhaps the most honest of the albums, but also the least accessible to new listeners. The expansive orchestration of Ceremonials is replaced with a raw dynamic of straightforward rock aided by a powerful brass section to help maintain the band’s distinctive touch of melodrama. This new approach of favoring horns over harp makes for a record with a well-defined identity. “The Queen of Peace” is the first truly great track on the new album. An emphatic, unrestrained stomper with a particularly memorable chorus, the song firmly establishes the record’s musical theme of coupling woeful lyrics with an upbeat rhythm to create a fascinating contrast. “The Queen of Peace” feels like a turning point for the story of HBHBHB and is also the place where the record reaches its full potential. From this point forward, almost all the songs sound like they might be found on Greatest Hits collections forty years from now. Her voice expertly transitions from soft and subdued to vigorous and cathartic and ultimately becomes a veritable siren’s song, shaping a simple musical arrangement into one of the best songs not only on this set, but in the band’s entire repertoire. The clap-happy gothgospel “Delilah” picks up the pace with Biblical references and a Sturm und Drang dynamic, while Welch, ever the extrovert, keeps exploring new vocal avenues. The bluesy “Long & Lost” is effective in its simplicity while “Caught” and “Third Eye” alternate between tender melancholy and shouty groove, creating a skillfully paced musical narrative that lends itself well to repeated listening. This song is executed to perfection, as the band summons up a wild energy to match the ferocity of Florence’s voice. If the closing track feels somewhat different from the rest that might have something to do with the fact that it was the only song produced by Paul Epworth. It sounds almost like the first chapter of a new story. If “Mother” is a sign of things to come, then Florence + The Machine has a bright future and a solid position in the indie rock scene. 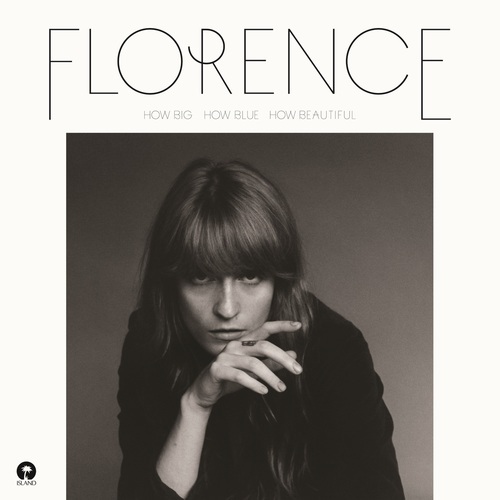 With profoundly personal lyrics telling of failed relationships, almost debilitating vices and emotional aimlessness, How Big How Blue How Beautiful is definitely an acquired taste. It’s certainly a powerful album, but it doesn’t have the instant charm of Lungs and Ceremonials. However, it makes up for that with a disarmingly honest narrative that will almost certainly help cement the record’s legacy over time. It’s a work best understood by people who are already familiar with Florence Welch’s songwriting and cognizant of the context of the lead vocalist’s creative and personal journey at this point in time. Seen in context, even the less-stellar songs like “What Kind of Man” and “Ship to Wreck” possess a certain depth that might evade the neophyte. For the new listener, How Big How Blue How Beautiful might be a skillfully crafted indie rock album that takes a little warming up to, but for the knowledgeable Florence + The Machine enthusiast, the band’s latest work is nothing less than exceptional. Hey, I’m glad you enjoyed it. 🙂 So sorry about the late reply. I was out of the country on vacation for a while and had little internet access. Thank you for reading! I’ve greatly enjoyed reading your reviews of Florence + the Machine. I’ve only recently become a fan and am trying to analyse why, because this type of music usually isn’t my thing at all! Yet I’m hooked. So thanks for your thoughtful pieces. It was a really great show and Florence is an amazingly gifted and passionate vocalist, the beating heart of the band in my opinion. Can’t wait to see them again, hopefully soon. Hey, thanks for reading my post too! 🙂 My husband likes Florence only in small doses but my kids love her, so I’m not completely alone. Your review of the Paris concert is great, thanks for the link. I’d dearly love to see them live, but they’re only doing shows Australian shows in Sydney and Melbourne this year. Hopefully they’ll do a bigger Aust tour next year. BTW, I noticed that you’re a Patricia Barber fan – my husband and I both love her work. For some reason WordPress won’t let me reply to your latest comment, Marl. As for Patricia Barber: My wife and I became fans in 2013 when we got our hands on a copy of Smash. It’s an absolutely fantastic record. I was so upset when it didn’t get nominated for a Grammy in the Best Vocal Jazz category that I decided to create my own (symbolic) Music and Myth Awards. I think we’re in the same situation with Patricia ads you are with Florence… she rarely visits Europe. Hello again! Just a note to say that I finally saw Florence live on Saturday night – my expectations were very high but she actually exceeded them! Just sensational. I’ve never seen a performer motivate such a massive crowd (around 10 000) to be so engaged, communal, and joyous. Musically, she’s astounding – I don’t know how she runs around like she does without missing a beat vocally. And the Machine don’t get much attention, but they’re tight as well as flexible. It’s great hearing from you again. Sorry about the late reply, I’ve been out running erands all day for the past few days. I just published my second novel recently which had me working round-the-clock for a while, so a lot of the extraneous stuff piled up. That’s also the reason I haven’t posted to The Music and Myth recently, but, now that my novel-writing work is done for a while, I plan to post some more articles in the following weeks. Its so cool that you saw Florence live. My wife still asks me every week when we can go see Flo again; it’s definitely in the works for next year. Hope she’ll be kind enough to grant me an interview. Ioana (my wife) still remmbers the 2012 concert as one of the greatest experiences of her life. As for Flo never being off-beat, I actually thought about that recently. It sems to me she has developed such a unique style vocally that she has put herself in a position where she just can’t do anything wrong… it’s a very interesting approach. Sort of reminds me of Tom Waits in that respect. I have to admit that, even though it took me a while to warm up to the new record, I actually ended up loving it, so much so that it’s in “the running” for the Music and Myth Best Vocal Record of 2015. So far, not a week goes by without me listening to at least part of it, I just can’t get bored. Congratulations on your new novel! I want to check it and the previous one out so I just bought them on kindle. Very interesting comparison with Tom Waits you make there. That would be great if you got an interview with Florence, and I hope you & your wife get to see her live again. I’ll be queuing up again that’s for sure (my husband’s even a convert, even though he’s still not crazy about her records). BTW I will just mention that the live version of ‘Mother’ just blew me away – Florence just killed it. She looked as if she absolutely loved singing that one. Marl, thank you! I’m honored by your interest in my work and I hope you’ll enjoy the stories. I’m right in the process of getting the manuscripts professionally edited to smooth out any typos or grammar issues that might have escaped my proofreaders. I couldn’t afford a professional editor until now, but I plan to take the books to a wider audience next year and spend a lot of time on marketing so it was a step that needed to be taken. Hope to have the new versions uploaded by mid-January. Your device should update them automatically if you have that setting activated. Regarding Flo: my wife and I are already looking into an April 2016 concert in Vienna (which is pretty close to where we live). Wish me luck! Mother is my favorite track from HBHBHB. I think the chorus has a sort of unhinged energy that fits her so well.